When a Power of Attorney is Misused – What can a Foreign Claimant do? Instances arise where one individual must confer or give the power to make decisions on their behalf to another person. 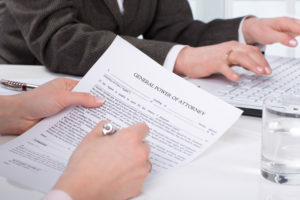 One such method is the use of a Power of Attorney, which consists of a written authorization that allows the attorney-in-fact or agent of the one granting such power (the grantor) to act for the grantor in their personal or business affairs or with respect to a legal matter. By being conferred such power, the agent or attorney-in-fact is bound as a fiduciary to act in good faith on the grantor’s behalf. Unfortunately, a breach of such trust occurs all too often. One example that our law firm litigated involved an elderly woman, M.H., from Munich, Germany who had utilized her life savings to purchase a home in Arizona. M.H. spent part of the year in her native Germany, and her friend, G.C., a German who had immigrated to the United States, looked after the home for her. G.C. ultimately desired to move out of state, and convinced M.H. to sell the home, assuring her that she would forward to M.H. the sale proceeds. In order to accomplish that goal, G.C. told M.H., she would need a Power of Attorney in order to sign the listing agreement, related real estate documents, the purchase agreement, and ultimately the closing documents. As part of the process, G.C. was to use the Power of Attorney to collect the full sales proceeds for the home. The home was sold, the proceeds were collected, but the funds were never sent to Germany. M.H. was in her 70’s, spoke no English, and was devastated. Utilizing my native German proficiency, I was able to explain to M.H. that we would sue G.C. where she currently lived in order to pursue the money. A lawsuit was brought in federal court, asserting claims of fraud, breach of fiduciary duty, conversion, unjust enrichment, promissory estoppel, fraudulent misrepresentation, breach of contract, fraudulent transfer, and civil conspiracy. As we learned, G.C. had utilized the money to purchase a large acreage and home, and she had placed this property into a living trust in an effort to shelter it. Through litigation, however, The Jackson Law Firm, P.A. was ultimately able to seize control of this property on behalf of M.H. With the aid of a local realtor, and, ironically, by utilizing another Power of Attorney, we were able to sell the property on behalf of M.H. and collect the proceeds on her behalf. Thus, the moral of the story is to only grant the powers set forth in a Power of Attorney to someone whom you can truly trust. Not every abuse of a Power of Attorney has such a satisfactory ending. However, if you have questions about your rights, we urge you to contact us to discuss them. Please remember that such claims can only be brought for a limited time, as set forth within the applicable statute of limitations. Thus, we urge you not to delay in seeking advice.